^ Alameri, Mikko. "Trolleybus City of Tampere". Raitio (in Finnish). Suomen Raitiotieseura. Archived from the original on 2007-12-13. Retrieved 28 February 2009. Vantaa is a city and municipality in Finland. It is part of the inner core of the Finnish Capital Region along with Helsinki, Espoo, and Kauniainen. With a population of 228,678, Vantaa is the fourth most populated city of Finland. Nokia is a town and a municipality on the banks of the Nokianvirta River (Kokemäenjoki) in the region of Pirkanmaa, some 15 kilometres (9 mi) west of Tampere. As of 31 January 2019 it has a population of 33,539. Toijala is a former town and municipality of Finland, located some 40 kilometres south of Tampere. 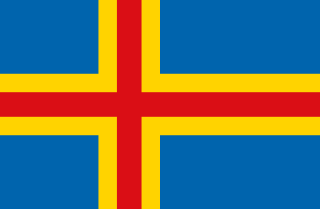 On 1 January 2007, it was consolidated with Viiala to form the town of Akaa. Hämeenlinna is a city and municipality of about 68,000 inhabitants in the heart of the historical province of Häme in the south of Finland. Hämeenlinna is the oldest inland city of Finland and was one of the most important Finnish cities until the 19th century. It still remains an important regional center. Pirkkala is a municipality of Finland. Satakunta is a region of Finland, part of the former Western Finland Province. It borders the regions of Southwest Finland (Varsinais-Suomi), Pirkanmaa, South Ostrobothnia and Ostrobothnia. The capital city of the region is Pori. The name of the region literally means Hundred. The historical province of the same name was a larger area within Finland, covering modern Satakunta as well as much of Pirkanmaa. Närpes is a town and municipality of Finland. Tampere Ice Stadium is a sports arena in Tampere, Finland. It is primarily used for ice hockey, and is the home arena of Ilves and Tappara of the Finnish Liiga. The ice hall, designed by the architect Jaakko Tähtinen was built for the 1965 World Ice Hockey Championships and opened the same year. The current capacity of the ice hall for hockey games is 7,300 spectators. Tampere ice stadium is the third biggest ice hall in the Finnish ice hockey league. Tammerkoski is a channel of rapids in Tampere, Finland. The city of Tampere is located between two lakes, Näsijärvi and Pyhäjärvi. The difference in altitude between these two is 18 metres (59 ft) and the water flows from Näsijärvi to Pyhäjärvi through the Tammerkoski rapids. The banks of the Tammerkoski are among the oldest industrial areas in Finland. There was a busy marketplace in the 17th century. Tampere was founded on the banks of the rapids, as the rushing water provided a great deal of power for the needs of industry. Hämeensilta is a bridge in Tampere, Finland, crossing the Tammerkoski rapids. The main street of Tampere, Hämeenkatu, runs along the bridge, connecting the Kyttälä district to the western parts of the city center. Hämeensilta is one of the city's best known landmarks, especially famous for the statues on the rails of the bridge. The arches of the bridge are made of concrete and they are coated with a red granite. The 68-metre-long (223 ft) Hämeensilta was completed in 1929. 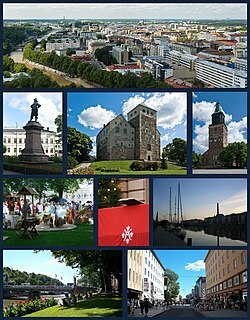 It is named after the Finnish name of the Tavastia province. Tampere University Hospital is a teaching hospital of University of Tampere in Tampere, Finland. It serves as one of the main hospitals in the country and operates in the facilities of Central Hospital (Keskussairaala) in Tampere, Pitkäniemi Hospital in Nokia, Valkeakoski Hospital in Valkeakoski, Sastamala Hospital in Sastamala and the Tampere Heart Hospital (Sydänsairaala).